Reconstructive dentistry is the art and science of restoring the whole mouth and face. The teeth, gums, bones, jaws, lips, and face may be involved. Years of neglect, disease, or natural aging can cause wear and collapse of the teeth, jaw, and facial features. 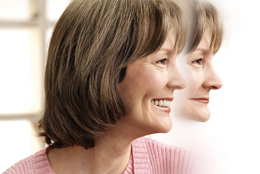 Unhealthy bone loss can make your jawline recede. These complex changes can be restored by rebuilding the teeth, restoring the bite and improving the boney foundation. Most often our treatment is limited to the teeth, gums and attached bone. However, this reconstruction can dramatically improve the facial appearance. Often people are complemented that they “look good” without looking like they had “work done”. The “age of dental artistry” includes natural looking crowns, bridges, partials, dentures, implants, veneers and lumineers. We take into consideration the facial shape, eye symmetry, skin tones along with how much tooth structure shows when smiling. We have carefully chosen a dental design lab with a reputation built on exceptional work and reliability. It is the visual “little extras” that we focus on that takes full mouth reconstruction cases to the highest level of excellence.